Login forms are the one which your users will see quite often than any other pages on your site. We spend several dollars to get a lead and use different strategies to convert them to a member. So the login form we are going to use on our site or app must reflect all these efforts. We in this list have collected free login forms with modern trendy design, which you can use for your site and as well as for your web and mobile based applications. Nowadays there are several apps and websites which let users create a free account. Each website recommends the user to create a strong password with the mixture of characters and symbols. Remembering all the unique password is a difficult job for users. So as a solution, many applications and websites are providing social login option. By the social login option, the process made simpler. We in this free login forms list have collected some of the templates that provide you social login option. One thing you have to keep in mind is these are all HTML templates and you have to take care of the backend work. To make things a lot more easier for the WordPress user, we introduce you the Login Customizer plugin. 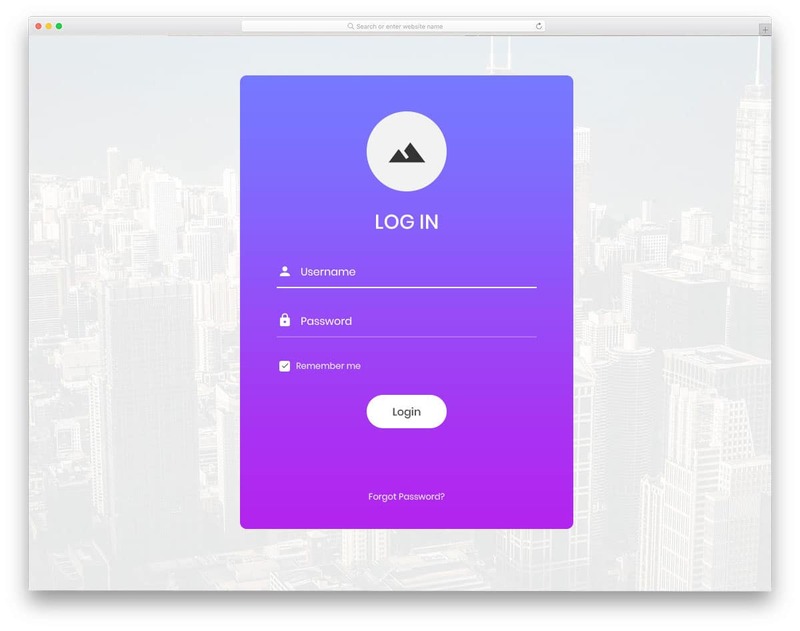 This plugin allows you to easily change the login screen in a fraction of second. The creator of this template has made it completely customizable. You can easily edit the logo, background image, fonts and lot more. The Rest of the login templates mentioned below are made of HTML and CSS framework. You have to work on the raw file to integrate with your website. The WordPress Login customizer already has some pre-made templates to make the setup simpler. Saying that, let us get into the list of free login form templates. 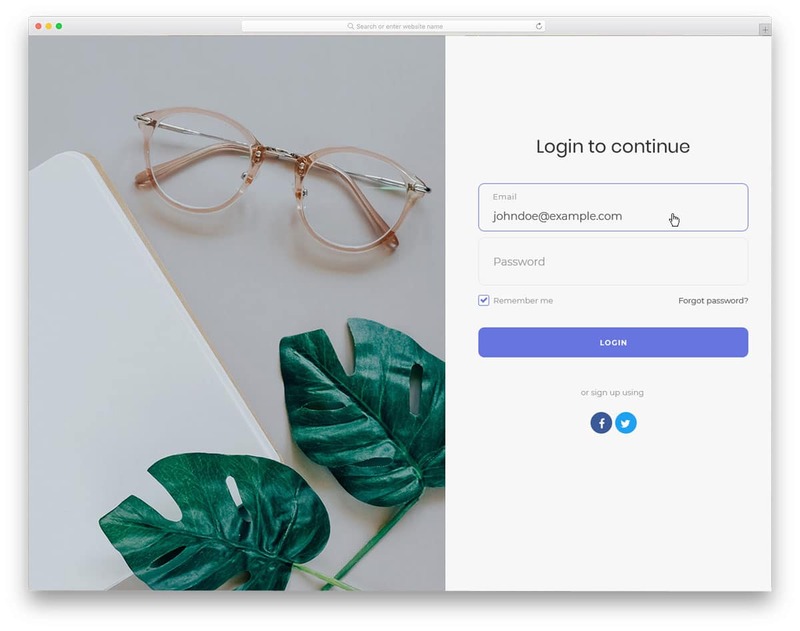 If you are looking for a login form that can be used for all types of website and mobile application, then this is the best one. 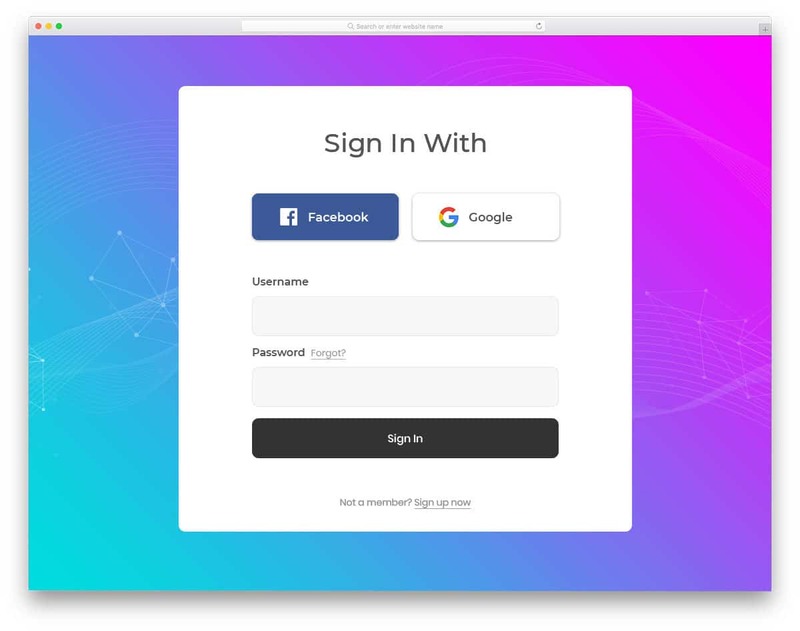 The login form created here is the ideal one with sleek animations and necessary options given straight in front of the users. This template includes both the login form and the registration forms in it. The layout smartly adjusts based on the number of fields, so mobile users can also interact easily with this form. The only thing you need to add to this template is the field validation in the registration forms. Other than that this form is a perfect option for websites and mobile applications. 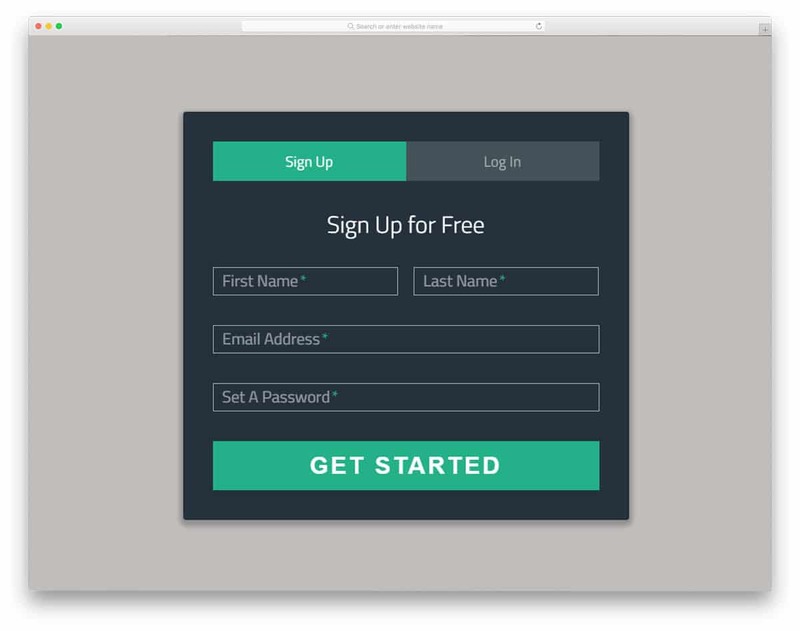 Login form 1 is the best login form created using the latest HTML5 and CSS3 framework. In this form template, you get the option to show user login image or you can show your website logo here. The logo part has a small gimmick in this template, it moves according to your mouse movement. To indicate the user which form field they have selected a small animation effect is used. Just below the call to action button, account recovery option is given. At the bottom, you have the option to take the user to account signup form. If you are looking for a creative login form for a modern website tepmlates, then this the best option. 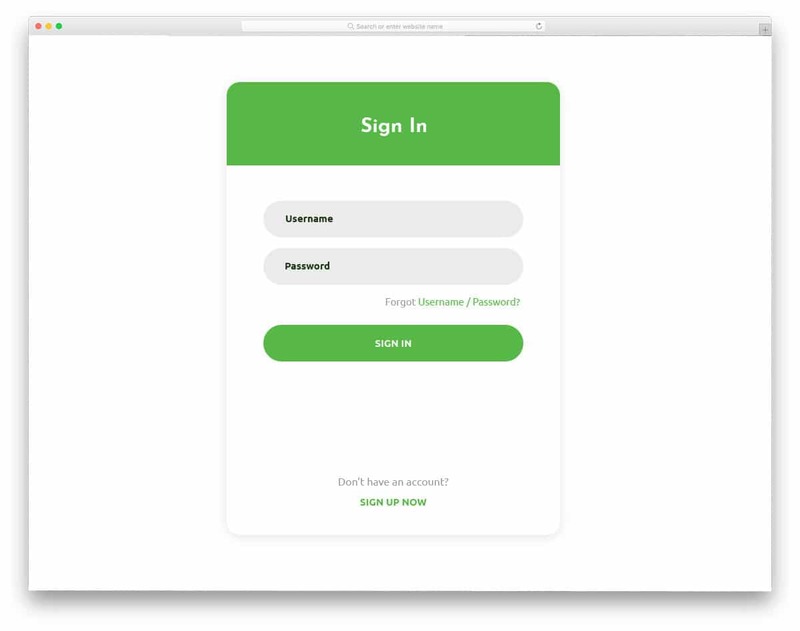 The second login form version is designed like a mobile app login form. Though this template looks simple, minute detailing done using visual effects make this template a unique one. On the clean white background, the texts are clearly visible for the users. Most of the free login forms won’t give you the option to see the password, but with this template, you can see and hide the input password. To indicate the users which form field they have selected, small form line loading like animation effects is used. The developer of this template makes use of the gradient color effectively. Login form 3 is quite an opposite to the second version mentioned above. 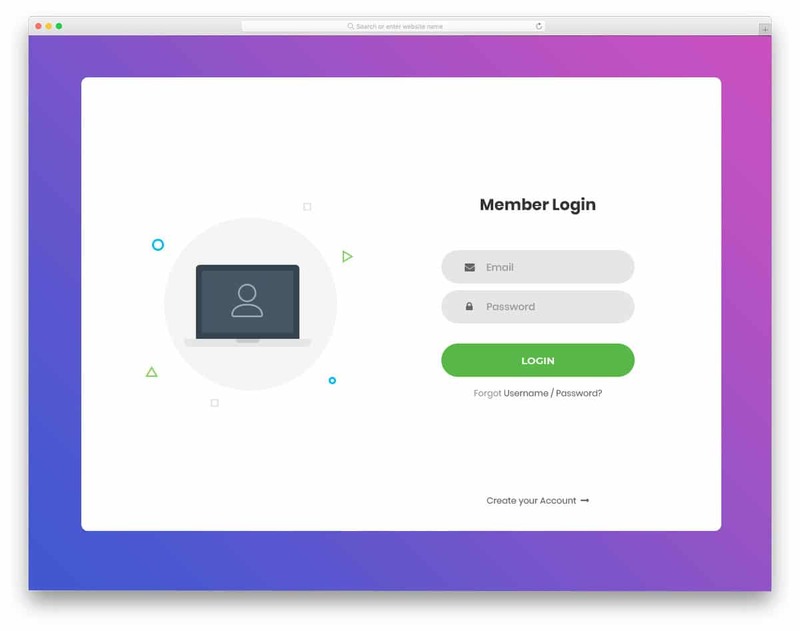 This template uses gradient color for the form background and white animation effects for the form fields. You can change the image background if you want or else you can just use the form for your site. This login form gives you the space to add “remember me” option at the bottom. Even though many of us are using password management tool, still this option becomes handy for many users. At the top, you have a big space to add your logo. If you are making a brand focused site, these small details will help you maintain the consistency throughout the website template design. 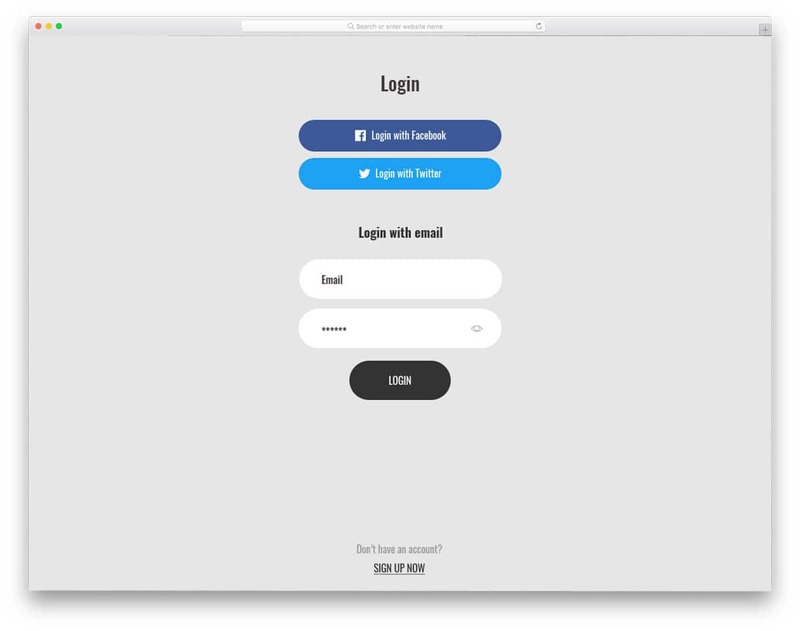 This is a long login form template, which gives you more than enough space to add all the form fields, social media profile links and signup link at the bottom. With the help of the latest HTML5 coding, this template gives you web elements with rounded edges to match the modern HTML5 website templates. Colors also look more natural with the help of latest CSS3 files. 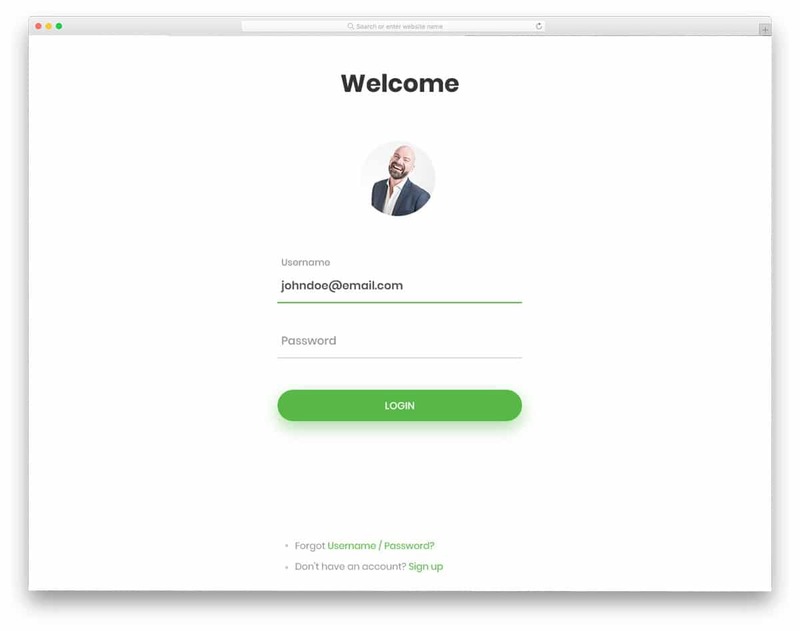 On the clean white background, the texts and web elements look cleaner on the login form. This form also supports mobile devices, so if you are looking a login form for your responsive website template then this form would be the best choice. Login Form 5 is not only a trendy looking form but also has trendy features. Most of the sites are supporting social login methods to make the login process simple for the user. Remembering password for each website will be a difficult job, providing a social login option will save lots of time for the user. This template gives you the option to add social login option for Facebook and Google. Remember this is just a template with front-end functionalities alone, you have to manually work with the social media platform API’s to make it a completely working form. The bold texts and big web elements make interaction with this template an easier job even on small screen devices. 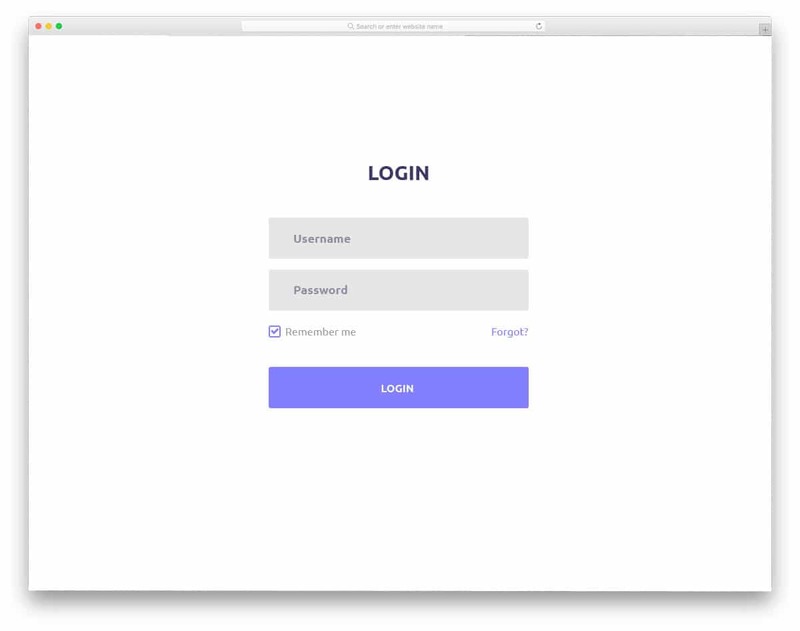 Login Form 6 is a minimal looking login form. With the borderless design, this template effectively makes use of all the spaces given. Another advantage of this borderless design is this template easily adjust to the small screen devices. Hence the user will experience a uniform interface design across all devices. This form gives you the option to add a profile image, username and password form field. In order to differentiate the call to action button from the clean white background shadow effects are used. In the demo version this form uses green color scheme, if you are following different color scheme in your website template, you can customize it easily. This form is a perfect choice for minimal design website templates. 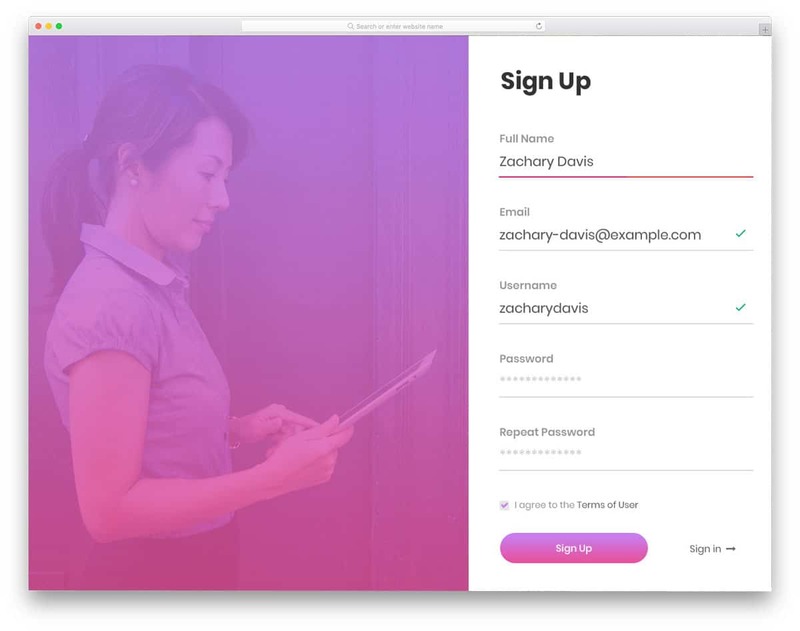 Login Form 7 is a classy looking bold login form template. With this form, you get both social login option and also password show and hide option. To match the minimal design of this template, the visual effects used is also mild and simple. This form also follows a borderless design and give a floating web design. The rounded corner helps one to easily identify that this template is made of the HTML5 framework. With the bold typography, this form design goes well with the creative website templates and news website template. The only thing which you might consider changing is moving the signup option little higher, in the default design, it is placed in the footer. Because moving it a bit higher will improve the signup option visibility. 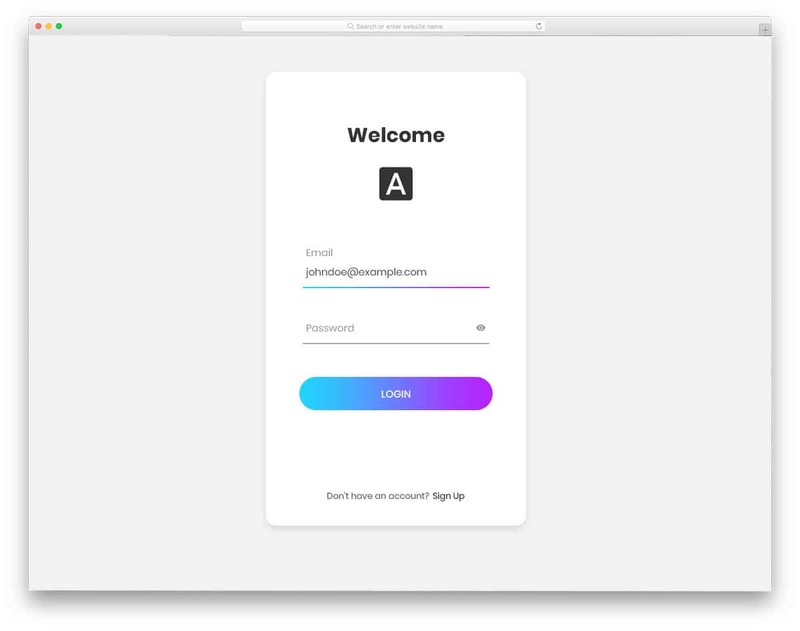 Login Form 8 is an elegant looking simple login form. With the simple neat design, the creator of this template gave us a professional looking form. 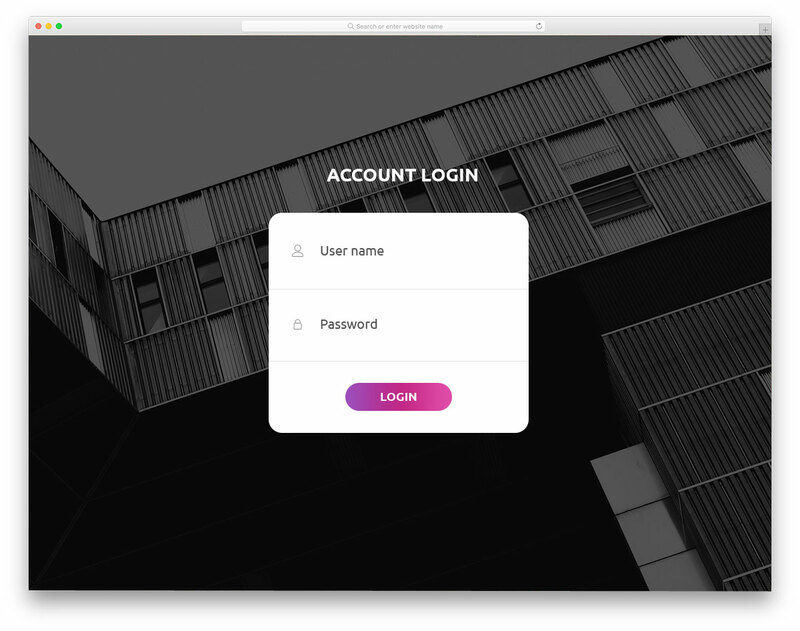 Use of shadow effects and natural looking web elements this login form is the best example of making use of latest HTML5 and CSS3 framework. All the options are placed in a reachable position, so the user no need to search for the options. Just below the password form field, you have space to add account recovery option. The floating card like design looks elegant on the latest quad HD smartphone screen since the pixel density is high in those screens, the form feels like popping out of the screen. 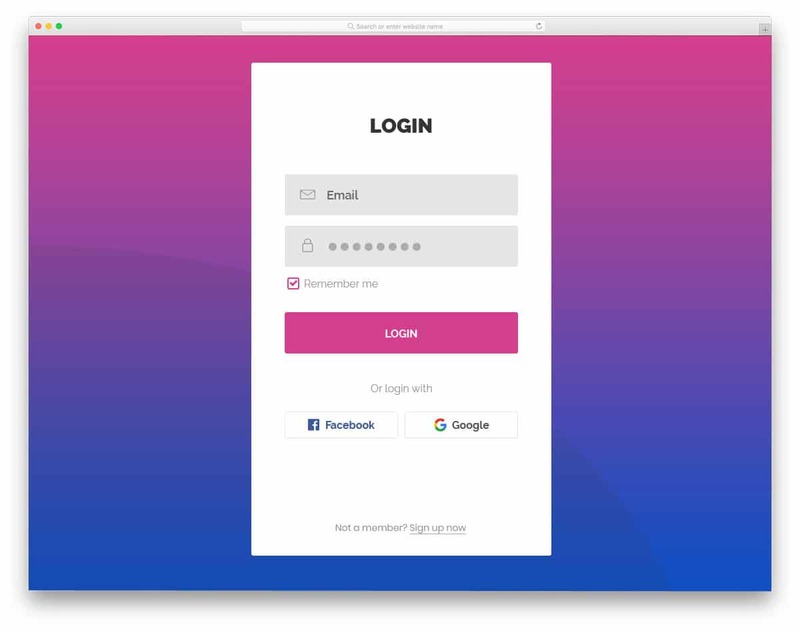 If you are looking for modern login form for your mobile application or web application, then the Login Form 9 is the best option. This form is also a long login form just like the login form version four mentioned above. 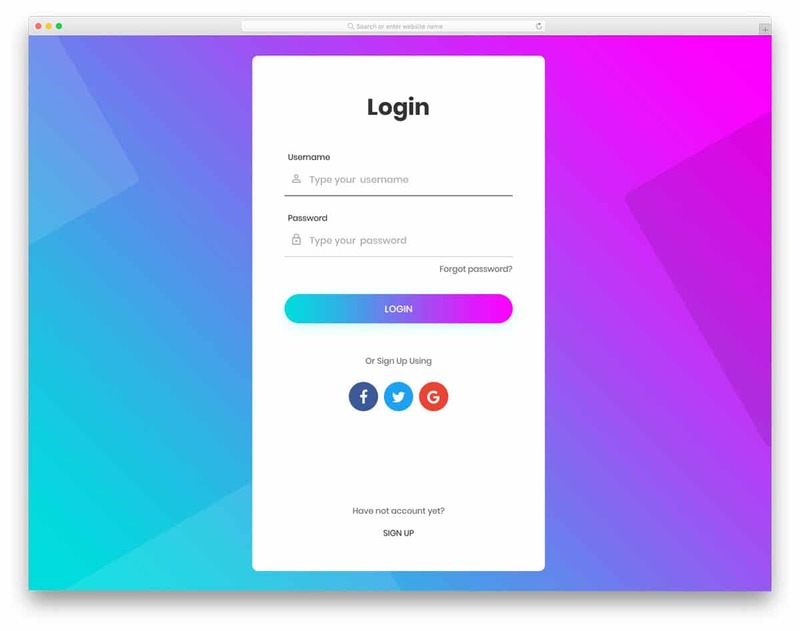 Login Form 9 follows the latest application UI/UX design, hence it will make an easy fit with the modern web design and app design. Since both the background and form field uses a same white background, shadow effects are used to differentiate the form fields from the background. Social media login option is shown just below the login form fields. Login Form 10 is a professional looking login form. This form would be the best addition to business sites and application based membership sites. The web elements used in this form are more boxier, the edges are not rounded like you see in other free login forms in this list. Text labels are used to show the user what detail needs to be given in the respective form fields. This template also gives you the space to add remember me option, again this is just a framework. To make this template completely working you have to manually do the backend work. Since all the front-end works are done perfectly, you needn’t worry about it unless you need to customize the form template. Login Form 11 is a hybrid of form version four and form version ten mentioned above. It is a long form with boxy rectangular web elements. With this form, you get the option for both to keep users logged in and social media login option. 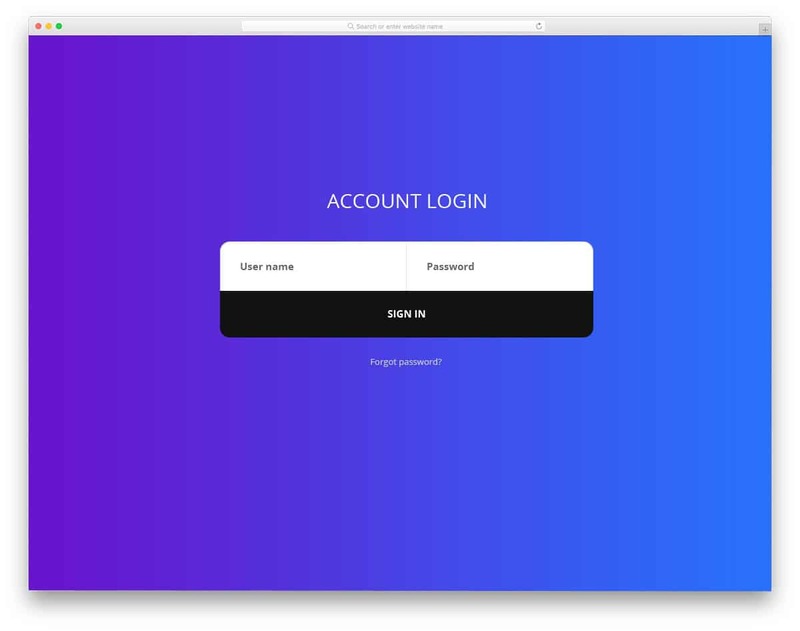 Since it is a full-page login form the designer has used gradient background on which the white login form looks attractive. The white background of the form also makes the readability easier on all types of devices. Like most of the modern website templates, this form is also optimized for the mobile views and all types of famous browsers. 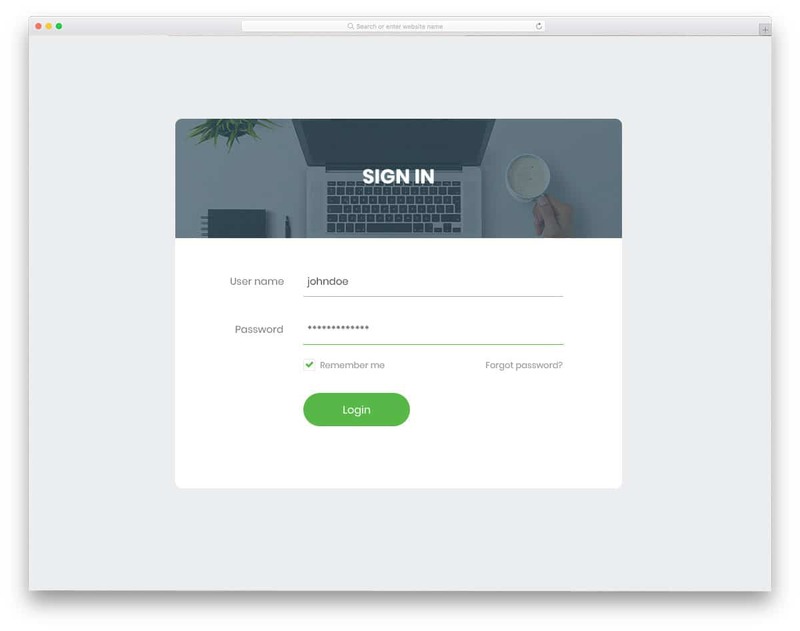 Login Form 12 is a perfect login form template for listing website templates and other types of website templates for communities. To fill the full-page design of this template, image background is used with bright color overlay. 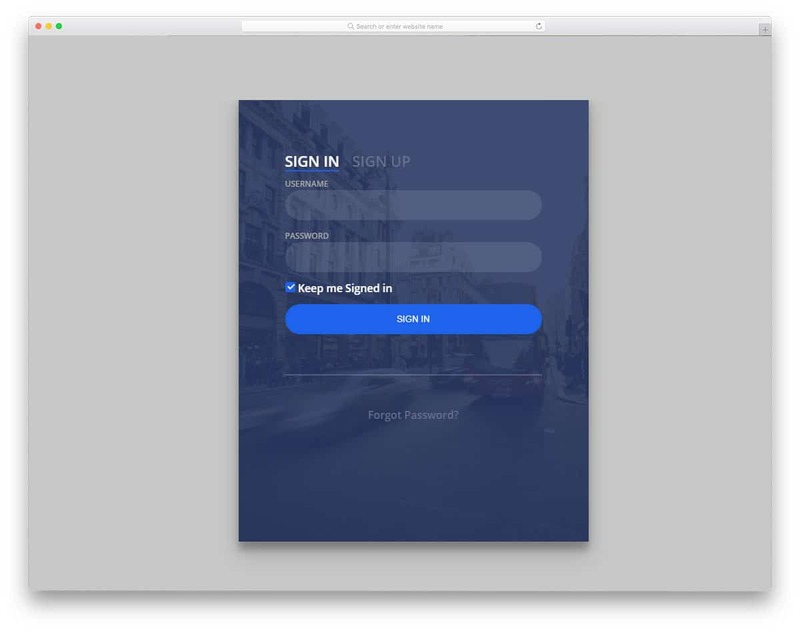 Since this form uses a borderless design, an image background will make this form looks clumsy, hence the use of blue color overlay is a wise design idea. In this login form, you have the option to add a profile image, username and password form fields. 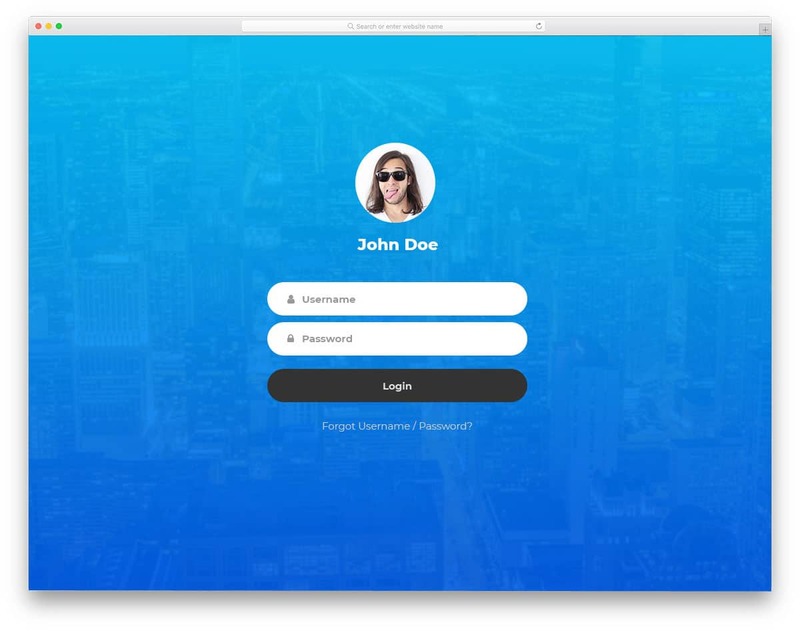 This login form uses blue color as the default color scheme, for the hover effects and other animation effects. If your website template follows any other color schemes, you can change it easily since it uses the latest CSS3 framework. Login Form 13 is a perfect login form for a business website templates and other consultancies related website template. Instead of using a full image background, this template uses split screen design to make use of the full-page design. On the left major portion is reserved for adding images, which you can use to say about your organization or latest news. To the right, you have the user signup option, at the bottom you have the option to switch the form to user login form. The signup form supports field validation to make sure that the user has filled all important fields. With big bold texts, this template makes readability easy in both small screen and big screen devices. 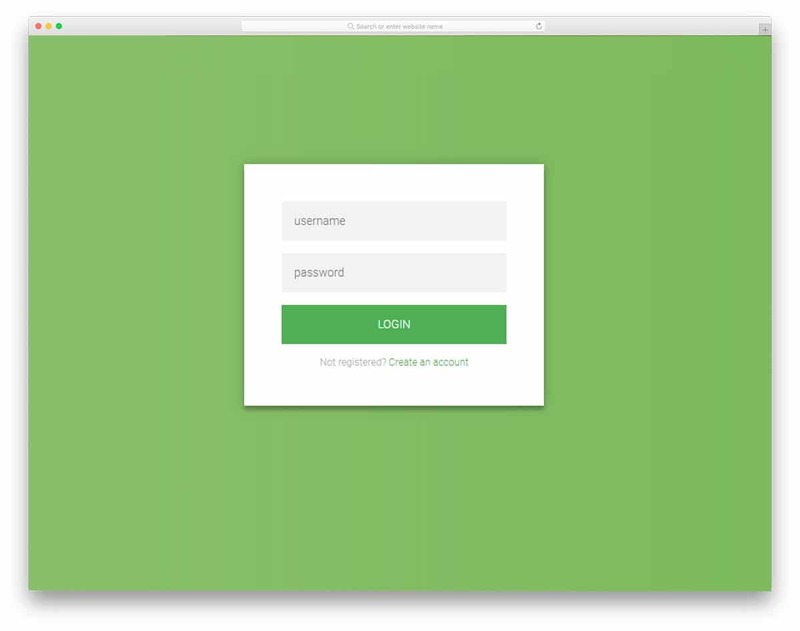 Login Form 14 is a simple and minimal style login form. If you wish to use this template without any changes, then this template is a perfect option for minimal websites. With only black and clean white color scheme, this form template uses the common minimal website template design style. This form gives users the option to show and hide input password characters. Login Form 14 is fully functional from the front end, so you no need to make any basic development work again. All you have to do is to take care of the backend work and do other integration works. Login Form 15 is a tweaked version of the fourteenth version form mentioned above. This form also uses clean greyish background and a neat contact form at the center. A small portion is reserved at the top to show images and bold “Sign In” text. This template does not use attention-grabbing animation effects, but the visual effects used a sleek and clean. To indicate the user which field they are editing, green lines are used. This form uses green color as the primary color scheme. You also get space to add keep the user logged in option just below the password form field section. Login Form 16 can be used for construction website templates as such without making any changes. Form labels and line icons are used to indicate the information to be filled in the form field. Visual effects are used intuitively to make use of the given spaces. The default form size is smaller, so you can use it anywhere you want on your website. But in the demo version, the form is displayed as a full-page form with an image background. Since this form is wrapped well within a white container box, clean image background is used without any color overlay. 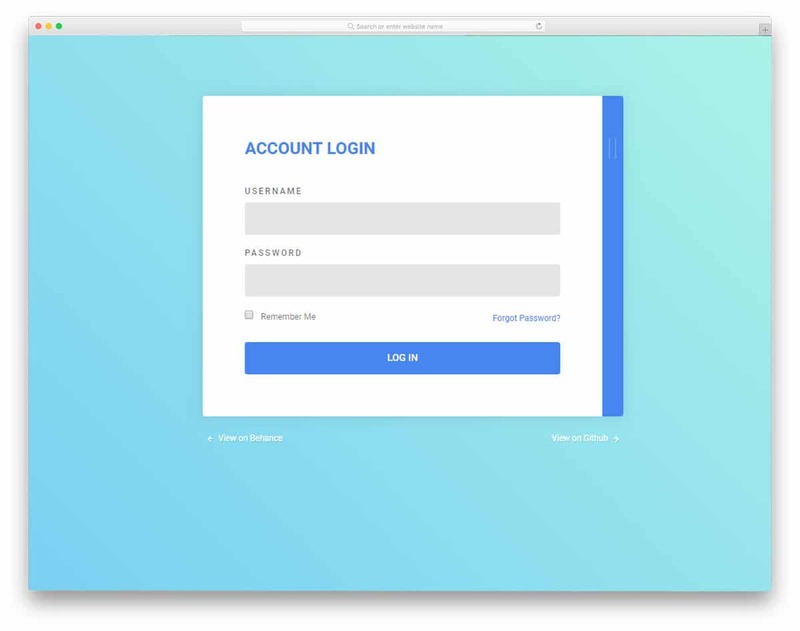 Login Form 17 is a split screen style login form template just like the form thirteen mentioned above. Instead of using the entire page this template uses a boxed-width style. The screen split equally so that both images and the contact forms can be added freely. 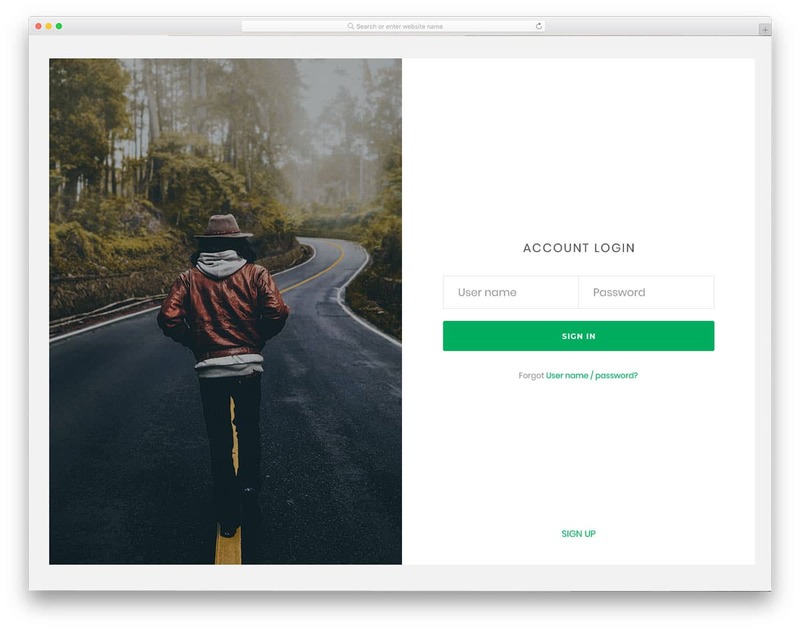 The image on the left side can also be used as an image slider, if you are looking a login form for a photography website template, this style would fit perfectly. 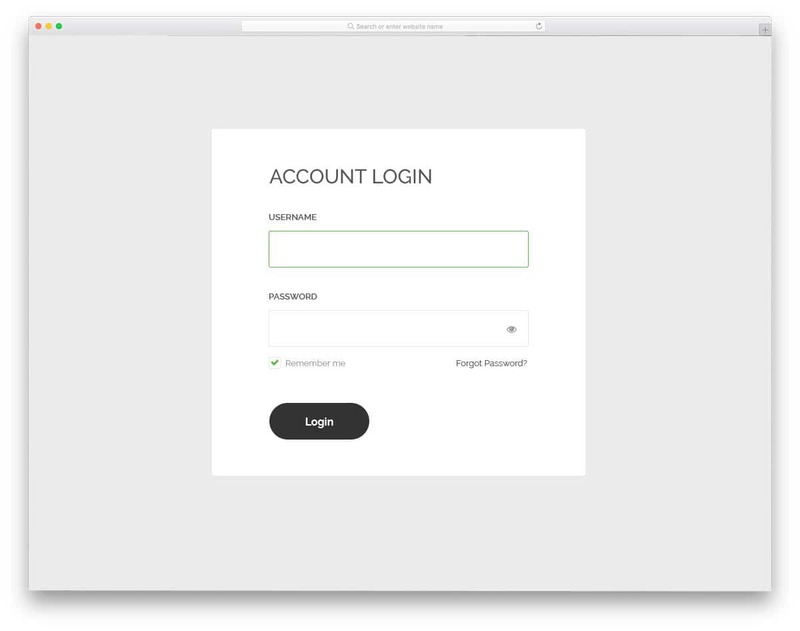 On the right side, the login form is made to fit well in a single line, visual effects are used to highlight the current field. Login Form 18 is a corporate style form. With neat design and professional color scheme, this template makes a perfect fit for modern corporate website templates. The full-page design of the template is handled effectively with the split screen design. Boxy form fields give you more than enough space to show bold texts neatly and clearly to the users. Animation effects are used smartly to make use of the given space effectively. Just below the login call to action buttons you have the option to add social media login and signup option. 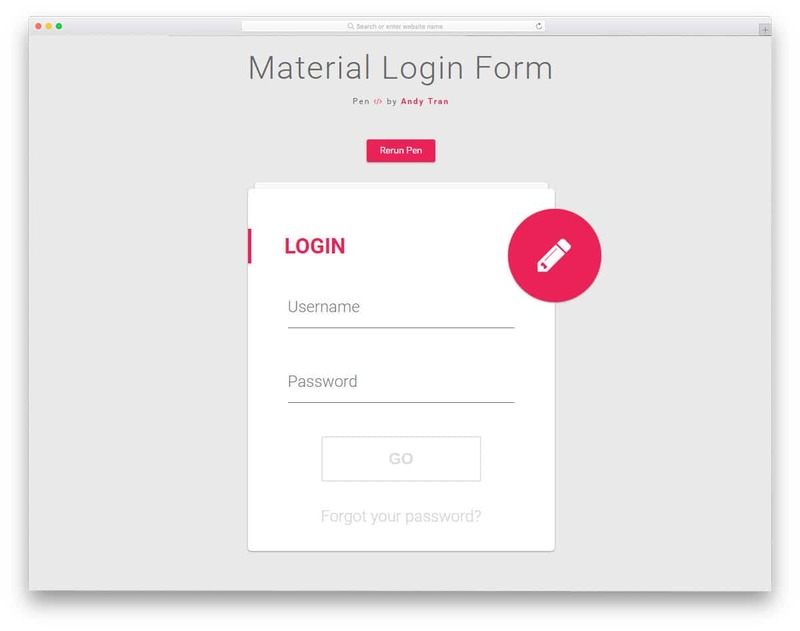 This well-coded form template can be added to a website template or integrated with any other platforms easily. 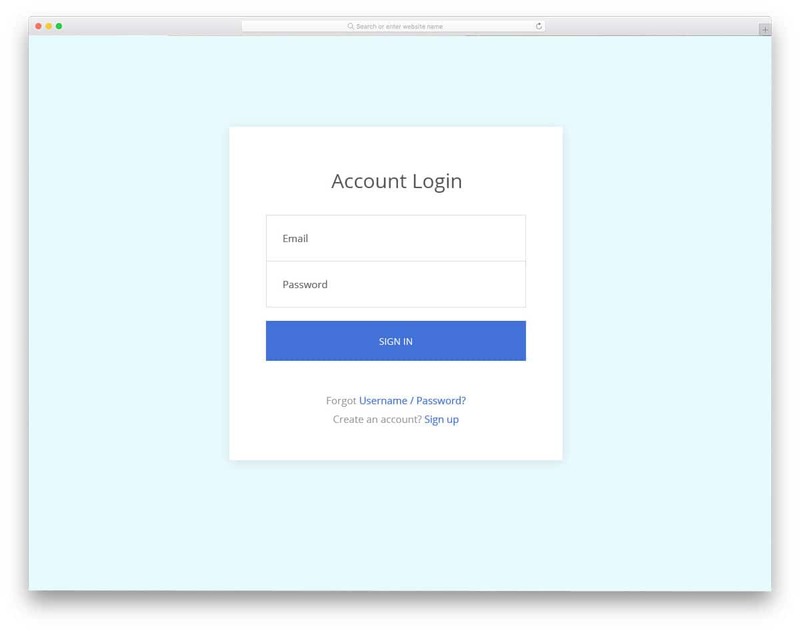 Login Form 19 is a typical login form template which has all the design and features you will expect normally in a login form. With a large rectangular form field this templates gives ample amount of space to show texts neatly to the users. The clockwise filed indication animation is neat without lag. Equal space is given to texts and fields to make it look clean. This form uses latest HTML5 and CSS3 framework, hence developers will find it easy to work with this template. 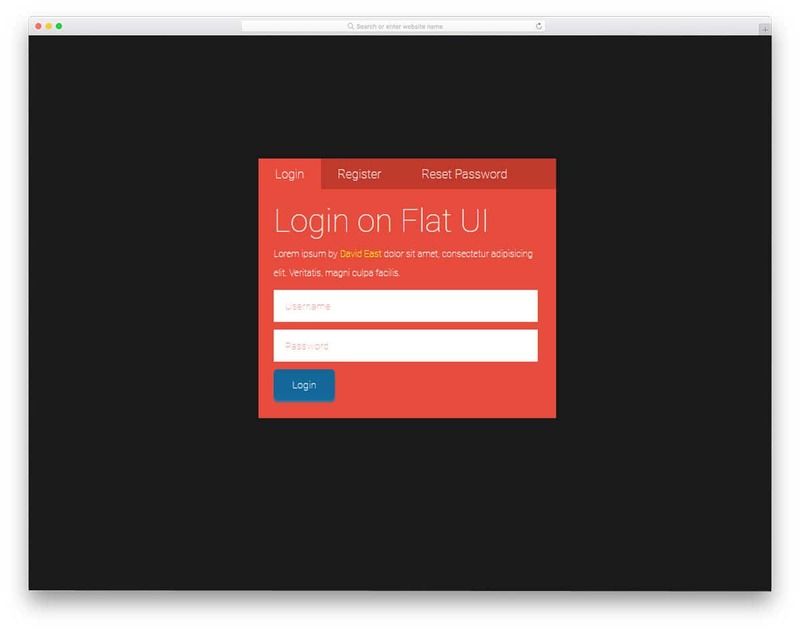 Login Form 20 is a neat one line login form. With this straightforward template, you get a neat looking form. The username and password fields are added side by side to make the form fit within one line. If you are using a one-page template you can use this form on your site. 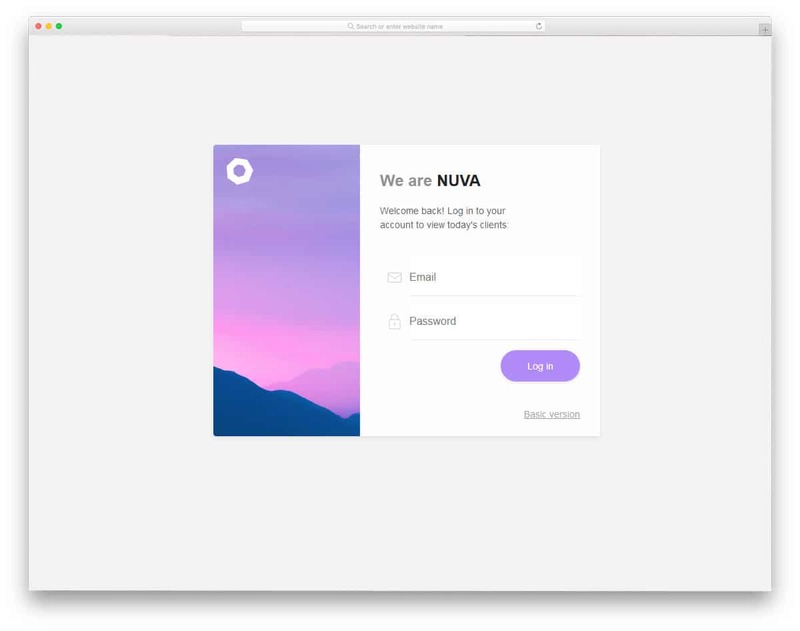 The hover effect of this form uses gradient color which is similar to the background color scheme. Since this template uses the latest CSS3 framework, editing the template will be an easy task. Just below the sign in a call to action button, you have the option to include account recovery feature. Day 001 login form is designed for the travel agencies and hotels. As most users prefer online registration, giving them the option to maintain an account in your service, will let them easily book a ticket or reserve a table. Another biggest advantage of this method is you can give special offers to your loyal customers. Let the users know about the latest plans and offers for them. 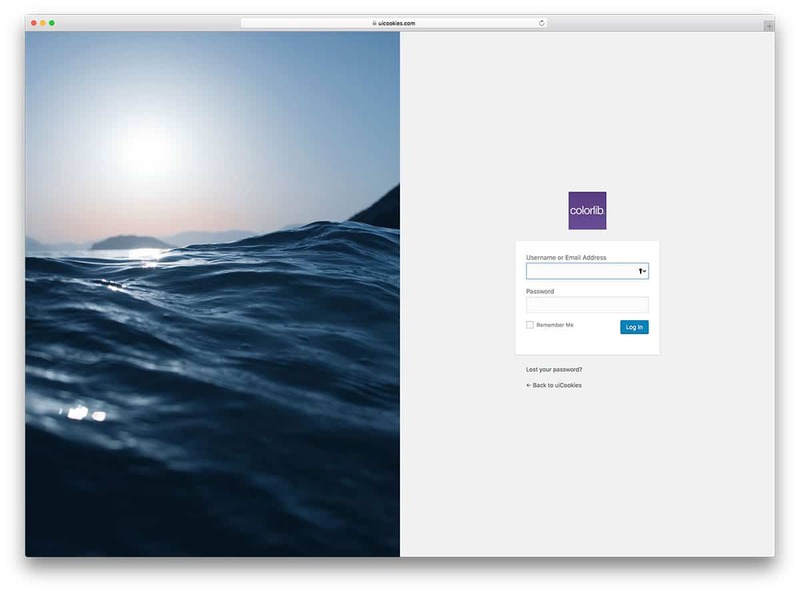 This login form gives you the option to add image background. As images are used extensively in the hotels and travel agencies, to let the user feel the places, this option will come in handy for you. The sing in and sign up options are shown directly at the top so that the users can switch between the forms when they want. 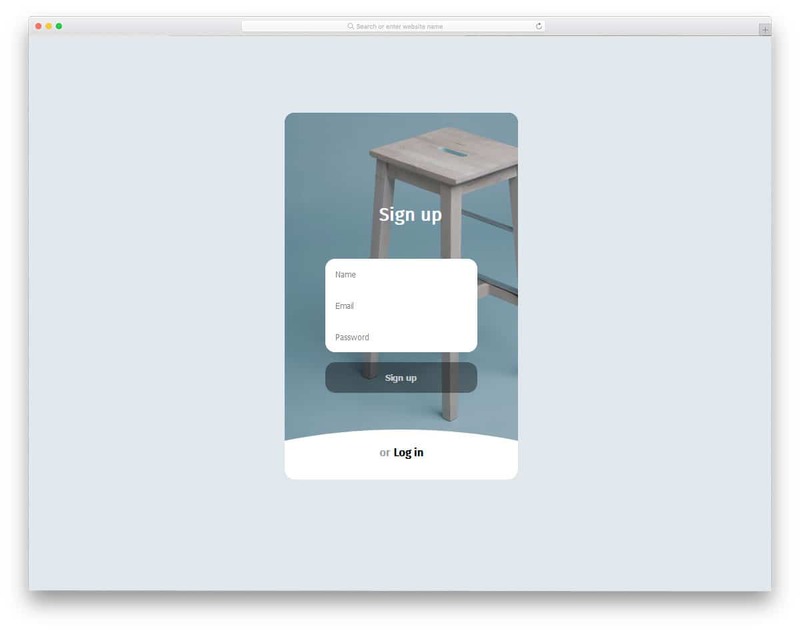 Flipping animations are sleek and quick so the user won’t feel any lag while they use the form. Material design gives us plenty of creative ideas and most importantly the fluid interactive feel remains the same across all types of devices. The designer of this template has used a horizontal animation effect to bundle both the sign in and registration form. If you are making a form for a photography website or other creative website, then this innovatory form will fit in easily. Because of the polished smooth animation effects, this form can be used in mobile applications as well. As the registration form cue and the default color scheme are same, some of the users may not find the form correctly. Try to use a sign or words to let the user know about the registration form. Signup/Login Form is a professional form, which you can use in any business websites. The creator of this template has taken care of the primary functions of a form. So most of your job is reduced with this form. All you have to do is to take care of the integration part. Since this template is designed for business purpose, all the visual effects are kept very minimal. The effects are buttery smooth with almost zero lag. No matter in what device the user is using this form, they can easily interact with the form. The form fields are made bigger with bold text so that the user can clearly see their input data. Field validation and error notification options are also given to let the users perspicuously know what they miss. If you wish to put multiple options in one place, then the Flat UI form is the best option. All the options are shown as a tab so that the user can switch the tab they want. Texts are not that much visible in the default design, this is might be the one thing you must change in this template. As the code used is shared directly, you can use this is a base to create your own form in a few minutes. The designer of this form has given you both login and signup forms. If you are looking for user-friendly login form for your mobile application, this one will impress you. The login and signup forms are placed on the same page. Without taking much space you can show both the forms on the same page itself. The animation effect is smooth and fluid so that the user won’t feel any lag. In the demo, you get only a basic outline. By keeping this as a base, you have work on the feature you want. As the developer has shared the entire code with you, customizing it won’t be an issue for a developer. 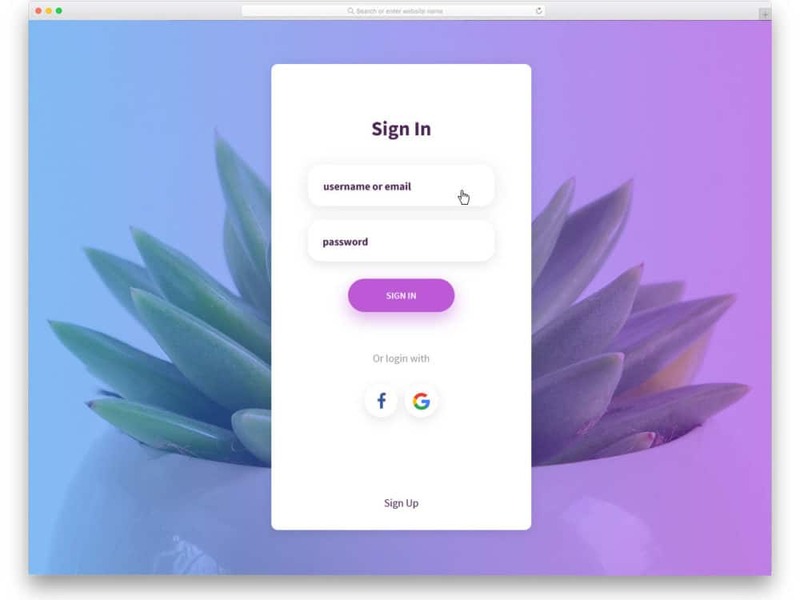 CSS-Only Accessible Floating Labels is a very simple colorful login form. At the top of the login form, you have text space to give a personalized message. Icons and form field labels are used to indicate what detail has to be given in a particular field. Subtle animation effects are used on the text fields and call to action buttons to make the form more engaging. All the effects are made completely using the CSS3 script. Hence the form won’t be heavy and also it performs better on both the small screen devices and computers.